Turmeric has played an important role in cultures around the world. India and China have used the spice in their foods and rituals dating back 5,000 years or more. Turmeric lies at the heart of Ayurvedic practices. Arab traders introduced it to Europe in the 13th century. Marco Polo wrote about the spice in his journals. The ancient Polynesians carried turmeric with them on their journey across the Pacific Ocean to Hawaii. We call it - Olena. Its use in Western culture is fairly recent. Here at Luana Farm we use fresh, raw turmeric rhizomes, sliced and cooked in our soups, added to rice and lentils, mixed into salad dressings, grated for our teas, simmered with coconut milk, ginger, cinnamon, and honey for a delicious warm drink, and juiced with our lilikoi and ginger. (Note: The parts of my Champion juicier are an interesting yellow color. Well worth it but remember turmeric’s dye properties when you prepare it.) Powdered turmeric can also be used and is not as strong of a flavor. Look for an organic source that is manufactured to high standards, or else you will not have the same benefits. Start with a small amount and add it slowly to your food as desired. A little turmeric goes a long way! Studies continue to find more benefits of turmeric for our bodies. It contains compounds called curcuminoids, the most important one being curcumin, which has powerful anti-inflammatory and antioxidant effects. This means turmeric helps us to fight off free radicals that can cause damage and it stimulates our body’s own antioxidant mechanisms. Plus, it helps to fight inflammation which plays a major role in most every chronic, Western disease. Curcumin improves the function of the endothelium, which is the lining of the blood vessels. This helps in fighting heart disease. It also increases brain levels of BDNF or Brain-Derived Neurotrophic Factor. This could be effective in reversing many brain diseases and age-related decreases in brain function such as Alzheimer’s and dementia. And studies have shown that turmeric can reduce the growth of new blood vessels in tumors, and reduce the spread of cancer, by contributing to the death of cancerous cells. The list of research and beneficial results of ingesting turmeric is endless. Turmeric outperformed many pharmaceuticals in its effects against chronic, debilitating diseases, and did so with no adverse side effects. That is a whole lot of benefit from one orange root! Turmeric enhances our outer beauty as well. Curcuminoids support blood and liver functions and that in turn helps our skin to look great. It fights inflammation and free radicals, both of which can damage our skin and cause premature aging. And cleansing with turmeric can help to maintain your skin’s elasticity. We use turmeric in our Volcano Clay Facial Mask for these benefits; plus it is a gentle exfoliant. You can blend your favorite clay mask with a bit of turmeric, honey, and water and create a scrub that can cool inflammation and help with acne. Apply evenly on your face or body, allow to dry, and then wash off with warm water. Again, a little goes a long way. Be mindful that turmeric will stain washcloths a pretty shade of yellow. I tell my clients to keep one just for this occasion. You can also blend some powered turmeric with baking soda and coconut oil for a beneficial and whiting toothpaste. No worries, your toothbrush will be yellow but your teeth will not! How can I grow my own raw turmeric? Turmeric or Curcuma domestic, grows from a branching rhizome that looks much like ginger root, to which it is related. It is of tropical origin, growing wild in south and southeast Asia. For those in cooler climates, it can be grown in a pot indoors. Its broad leaves smell like mango to me and the attractive flowers range in color from white to pink. For us, it grows everywhere on our farm. If it wasn’t such an amazing plant, we might consider it a weed. 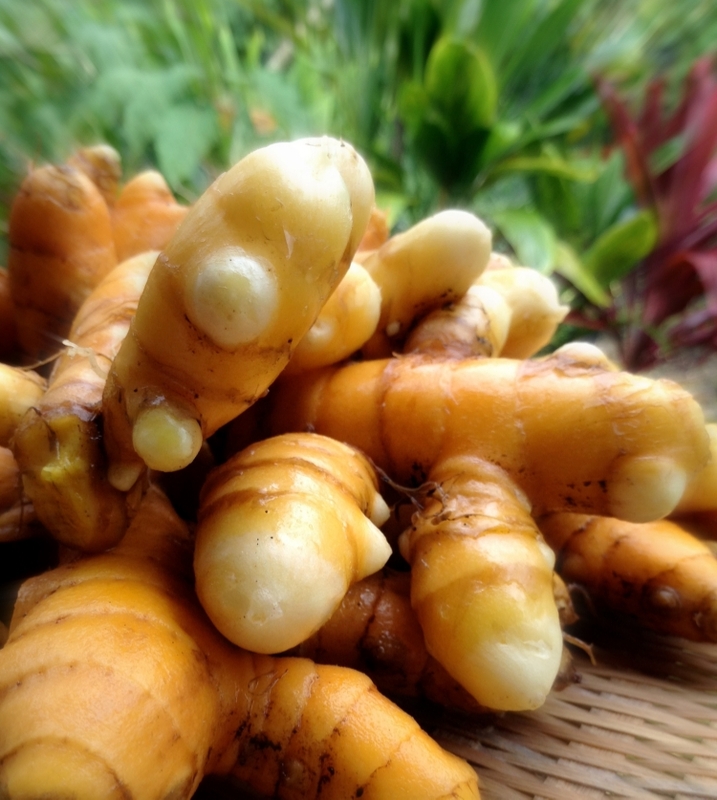 Here in Hawaii, you can easily purchase fresh turmeric root at the local farmers markets and to propagate, just stick them in or on the ground and it goes. To find a fresh turmeric rhizome on the mainland, check your local nursery or Asian market. Left alone in a paper bag in a warm, dark place, the “fingers” of the root will sprout easily. If you prefer, you can separate each “finger” and lay them in a seed tray with potting soil mix, cover with plastic, and place on a warming mat or the top of the refrigerator. Green shoots should appear in a couple of weeks, and then plant in a container of your choosing. Cover the rhizome with 1/2 inch of soil. Keep the plants in a sunny, south-facing window and water frequently. After several months, the rhizomes will begin to branch and spread. When the leaves begin to die back, carefully unearth the rhizomes at the edge of the clump to use in cooking, cleansing, or to propagate new plants. It is no wonder that turmeric is considered one of the world’s healthiest foods. It is inexpensive, mild in taste, and benefits every system in the body. Adding this powerful root to your diet is one of the best things you can do for your overall, long-term health and beauty.